[prMac.com] Taipei, Taiwan - Today, QuinnScape announces the release of Packing Pro 12.2, an important upgrade that adds flexible features, like extra import/export options, as well as new merging and filtering capabilities. Now, individual packing list categories can be imported & exported, allowing the user to construct lists in a quick, modular fashion. Importing & exporting can be done via email, AirDrop, iTunes, Dropbox, Box, iCloud Drive, etc. Also, when importing matching list categories (or entire lists, catalog categories or an entire Master Catalog), users now have an additional option to merge the content. List items of merged content can also have their filter-able attributes (like person, bag, and need-to-buy) automatically set en masse, based on the current filter settings. Lastly, several iOS 10 related bugs were also resolved. During the eight years that Packing Pro has been on Apple's App Store, it has been highlighted several times. Currently, it can be found in the "Travel Survival Kit" and "Travel Expenses" promotions. It has also ranked at #1 for iPads and #2 for iPhones in the U.S. App Store's Travel section. Besides Apple, Packing Pro has also been recognized by CNN, WSJ, BBC, The New York Times, Expedia and Budget Travel, and has earned glowing reviews on major tech and app blogs (Gizmodo, Mashable, Macworld, CNET and iPhone Life, among others). Packing Pro version 12.2 is an important upgrade that adds some great new features, like additional import/export options, as well as new merge & filter capabilities. Check it out today! 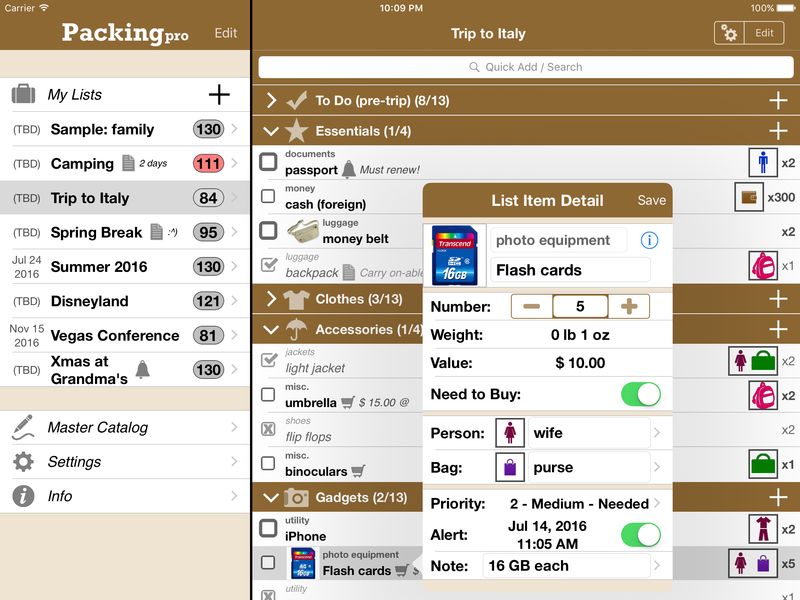 Packing Pro is a universal app that is available for purchase worldwide on the iPhone & iPad App Store for $2.99 (USD), or the equivalent in local currency. The basic Packing (+TO DO!) sells for $0.99. Promo codes are available to members of the press. For more information, please contact Quinn Genzel. Since its founding in October 2008, QuinnScape has been managed by Quinn Genzel. Quinn is best known for his popular, top-ranking travel packing apps: Packing (+TO DO!) and Packing Pro. Packing Pro has been recognized by Apple, CNN, WSJ, BBC, National Geographic, Budget Travel, Fodor's, CNET, Macworld and a host of others as one of their top apps for traveling. Other app created by Quinn include a grocery shopping list app (Shopping Pro), nature appreciation apps (iLove Nature and iLove Birds), 3D VR action games (R.I.P and Ghost Buddy) and high-quality puzzles (the aQ's Pro Slider Puzzle series). Copyright (C) 2008-2017 QuinnScape. All Rights Reserved. Apple, the Apple logo, iPhone, iPod and iPad are registered trademarks of Apple Inc. in the U.S. and/or other countries.